Gilmore says AIB mortgage hike is "a commercial decision"
The Tánaiste says the government’s focus is on dealing with mortgage arrears, rather than directly controlling interest rates. 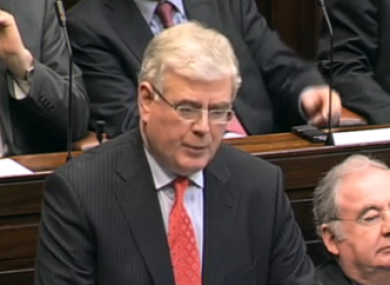 TÁNAISTE EAMON GILMORE has said the decision by AIB, EBS and Haven to increase their mortgage interest rates is “bad news” for affected mortgage holders – but that the increases are a “commercial decision” by those banks. Gilmore told the Dáil that the government’s focus on dealing with families in mortgage distress was to help them work through restructuring arrangements with banks, or have them enter the insolvency regime, instead of controlling interest rates. “The government has already intervened in relation to mortgage arrears, and in relation to addressing the problem of mortgage arrears,” Gilmore said, pointing to the new insolvency regime and the renewed drive to get banks to deal with struggling borrowers. Gilmore said Micheál Martin had overstated the impact of the rise, after the Fianna Fáil leader said the increase would mean increased repayments of €800 a year for an ‘average’ outstanding mortgage of €300,000. “The average standard variable mortgage in AIB is €128,000, which means that the increase is €24 a month,” Gilmore said. He added that the average mortgage with EBS Building Society was €102,000, equating to an increase of €17 per month. Both Martin and Sinn Féin’s Padraig Mac Lochlainn described the increase as ‘sneaky’, as it came just before an expected cut in main interest rates by the European Central Bank. Martin pointed out that a Central Bank report had found that banks were now actively looking to maximise profits on variable mortgages, because tracker mortgages were consistently loss-making. Email “Gilmore says AIB mortgage hike is "a commercial decision"”. Feedback on “Gilmore says AIB mortgage hike is "a commercial decision"”.